For years Kaliningrad has been allowed to decay as a forgotten Russian enclave surrounded by Europe. But now a movement is afoot to rebuild the city center. The castle too may soon dominate the skyline once again. When 39-year-old architect Alexander Bazhin looks out the window of his fourth-floor office, it's a bleak sight he sees: Shoddy concrete housing blocks constructed by the late communist regime stand next to rusted water fountains and apartment blocks from the Third Reich. A 20-story Communist Party fortress -- the "House of the Soviets" -- rises up in the center. The building is a ruin. The city center of Kaliningrad is not a pretty site. It's not uncommon for elderly East Prussians -- having arrived in a tour boat in the nearby port of Pillau -- to break into tears when they see to what architectural depths their city of birth has sunk to. The destruction visited on the former pearl on the Pregel River by the bombs of World War II was immense -- matched by hardly any other European city. Indeed, Kaliningrad, once known by its German name Königsberg, became a symbol not just of loss, but also of the destruction, of homeland. Some 30 divisions and two air fleets of the Red Army attacked the surrounded city during the final battle in April 1945, remembers Otto Lasch, the German Wehrmacht's commander in Königsberg at the time. They fired at the city "from thousands of barrels including Stalin organs for days, without interruption," he says. What remained was Immanuel Kant's transcendental philosophy -- and meatballs. Bazhin, who wears a pinstripe suit and light blue tie, thinks it's time to turn the tide. For one year now, he's been the chief city planner in Kaliningrad, now an oblast, or region, of Russia separated from the motherland by Lithuania and surrounded by European Union countries. A friendly man, he receives visitors in his granite-decorated studio in the heart of the old city. Thirty employees also grace the office, all of them young. No one here wants to run from the city's Prussian German legacy. On the contrary. To restore a sense of urbanity to the ravaged city center -- further wrecked by the Soviets -- Bazhin is going retro. He wants to rebuild entire residential neighbourhoods, filling them with "historically stylized houses." The cathedral, which was damaged during the war, has already been rebuilt. The "Fish Village" -- a group of old half-timbered houses and 18th century-style warehouses complete with pinnacled roofs -- is currently taking shape right next door, on the banks of the Pregel. But the city is presently the site of another, far more ambitious project -- that of rebuilding its castle. The defensive fortress was built by the Teutonic Order in 1255 as a jumping off point for crusaders heading east -- a military stronghold in the midst of a pagan wilderness, built on the ruins of the freshly conquered Baltic fortress Tvanksta. The pious "soldiers of God" advanced from Königsberg far into Latvia and Estonia in the 13th and 14th centuries. Prisoners taken on the crusades were sold inside the German Reich for the price of one ox each -- and the whole bloody enterprise had the blessing of the pope. Urban planner Bazhin is fascinated by the shape of the mighty castle and he has a large cardboard model standing in his studio. His co-workers have produced hundreds of computer simulations of the castle's tower "Bergfried," which was more than 80 meters (263 feet) tall. "Next month, the projection phase begins," he says. "The castle must be rebuilt." He estimates it will cost $100 million. Listen to the smartly dressed engineer and you'll hardly believe you're in Kaliningrad. The old Prussian center was considered a "hornet's nest of militarism and fascism" in the jargon of the communist rulers. In 1969, then party leader Leonid Brezhnev had the still impressive castle ruins blown up and the rubble cleared away with bulldozers, right down to the foundations. That kind of animosity is hardly to be found in Kaliningrad today. An isolated region, northern East Prussia led an impoverished and shadowy existence in the Soviet empire for decades, but now a fresh wind is blowing. Petro-billionaires and oligarchs from Moscow have discovered the region for themselves and they're bringing plenty of money, much of it of dubious origin, into the area. History is not their strong suit. Economic growth could be one reason. For the third year in a row, the enclave by the Baltic Sea has seen GDP jump by at least 10 percent. Bars, restaurants and hotels are springing up out of the ground and the city now has the second highest concentration of cars in the country. The old Amber Coast has become Russia's new place in the sun. From the perspective of the old moneyed aristocracy -- currently happily building villas for itself in the city -- Bazhin is just the right man for the job. They are hoping he'll give Königberg's fragmented cityscape greater harmony, and aren't too bothered how he does it. The architect is cleverly taking advantage of the trust that has been placed in him and doing what he can to drum up support for the reconstruction of the castle. During the recent opening of his studio, he invited young VIPs and Moscow patrons, offering them pieces of a cake shaped in the form of the Königsberg Castle. Towers and walls made from sugar icing were auctioned off to the highest bidder. Far more important is that Russian President Vladimir Putin likes the idea of bringing back the Prussian fortress. On a visit to the region last September, he promised the equivalent of $50 million from the state treasury. Putin, of course, also has an interest in a resurgence of Kaliningrad. His family is currently building a villa in the area, on the Courland Spit which separates the nearby Courland Lagoon from the Baltic Sea. But there's still plenty of work to do before the topping-out ceremony. The crusader fortress took on enormous proportions over the centuries with the inner courtyard stretching for fully 105 meters (328 feet). The west wing contained the Moscovite Hall with its collection of trophies; a mechanical elevator transported wine barrels into the cellar. Just how sumptuous the interior was can be seen in paintings showing the 1701 coronation of Prussia's first king, Frederick. Apparitors in festive dress heralded the grand event, followed by 24 trumpeters, drummers and 60 aristocrats. It was the beginning of the dream of world power. The annals record that the king's wife took a pinch of snuff during the enthronement ceremony and was rebuked by her bad-tempered husband. All this finery went up in flames in August, 1944. The British Air Force sent two waves of more than 800 bombers over the city. Newly developed fire bombs were dropped from bomb bays -- and 48 percent of all buildings were damaged or destroyed in the resulting inferno. The legendary Amber Room -- displayed as German war booty in the castle between 1942 and 1944 -- disappeared without a trace. Only recently has an exploration of the basement vault -- financed by DER SPIEGEL -- yielded new findings. Researchers have discovered old wine bottles and a collection of amulets. The remains of the castle's heating system were also found, as was a secret underground tunnel. Despite the near total loss of the original building material, Bazhin believes an accurate reconstruction is possible. "The castle was mainly built from bricks and it was plastered," he explains, adding that this makes elaborate stonecutting work largely unnecessary. "We can be done by 2010." 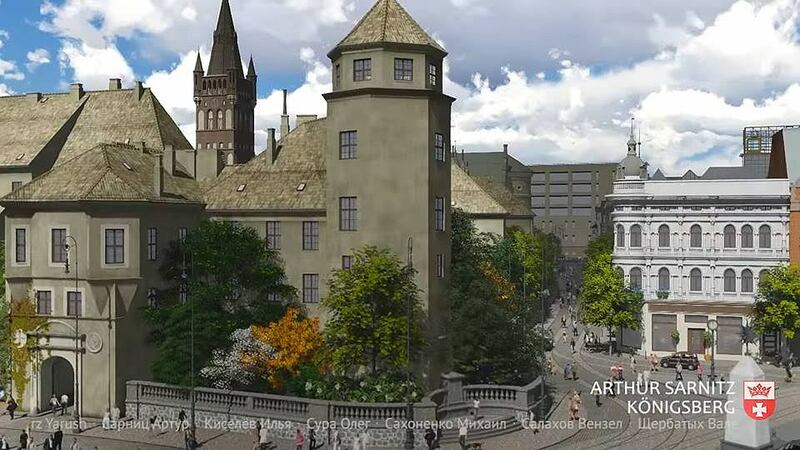 The architect has already charged people with searching through German archives for original plans and old blueprints. But, he says, if all else fails he could get by with the well-organized photo archives put together during the 1930s and 40s. Bazhin is considered a master of copying. Some time ago, he photographed a Wilhelminian villa in Hamburg -- and built an exact copy of it for a rich client in Kaliningrad, purely on the basis of his photographic template. Since no one objects to such a technique in Russia, the team responsible for rebuilding Kaliningrad can get to work. The reconstruction of the Prussian palaces in Potsdam and Berlin -- also blown up -- has been stalled for years, partly because the effete elite considers the imitation of historical buildings "kitsch." "I know this debate is going on in Germany," says Bazhin. "But not here," he adds -- and looks relieved. Okropny ten projekt z bąblami. W sobotę pełniący obowiązki gubernatora obwodu kaliningradzkiego Anton Alichanow w wywiadzie dla kaliningradzkiej agencji informacyjnej "Zapadnaja Pressa" powiedział, że dopóki stoi on na czele regionu, królewiecki zamek nie zostanie odbudowany. W sobotę pełniący obowiązki gubernatora obwodu kaliningradzkiego Anton Alichanow w wywiadzie dla kaliningradzkiej agencji informacyjnej "Zapadnaja Pressa" powiedział, że dopóki stoi on na czele regionu, królewiecki zamek nie zostanie odbudowany. Alichanow zakończył w ten sposób gorącą dyskusję wokół rekonstrukcji zamku, która toczyła się w Kaliningradzie od kilku lat. Kwestia obudowy królewieckiego zamku była częścią szerszego urbanistycznego projektu „Serce Miasta”. Celem projektu było „rozwiązanie problemu historycznego centrum Kaliningradu”. Historyczne, czyli przedwojenne centrum miasta to obecnie pusty plac i przylegający do niego teren wokół Domu Sowietów – pustostanu, który został wybudowany jako nowe centrum administracyjne w ostatnich latach istnienia Związku Radzieckiego i nigdy nie był używany. „Serce Miasta” ogłosiło dwa projekty na zagospodarowanie tego terenu, drugi z nich – „Post-Zamek” był dedykowany właśnie idei odbudowy zamku. Konkurs wygrał młody rosyjski architekt, absolwent mediolańskiej politechniki – Anton Sagal. Projekt Sagala z jednej strony symbolicznie nawiązywał do historycznej bryły zamku, z drugiej stawiał na nowoczesność i funkcjonalność, co zostało docenione przez jury. W jego składzie był m.in. niemiecki architekt Hans Stimmann. Mimo przeprowadzonego konkursu, nie było pewności, że będzie realizowany zwycięski projekt. W czerwcu 2016 roku Garri Goldman, wicepremier obwodowego rządu poinformował lokalne media, że został zatwierdzony plan budowy zachodniego skrzydła zamku, które będzie w skali 1:1 odpowiadać historycznej bryle. Zachodnie skrzydło miało być gotowe na Mistrzostwa Świata w Piłce Nożnej w 2018 roku. Ideę odbudowy zamku w jego historycznych kształcie od wielu lat propagował Artur Sarnitz. Dla Sarnitza odbudowa zamku byłaby symbolicznym powrotem miasta do jego europejskich korzeni i stanowiłaby przykład pokojowej koegzystencji przed i powojennej kultury. Przygotowana przez Sarnitza i jego biuro projektowe wizualizacja zamku, oparta na materiałach archiwalnych, wygrała w internetowym głosowaniu mieszkańców Kaliningradu na projekt odbudowy. Wiele wskazywało na to, że to właśnie jego koncepcja przekonała ówczesnego gubernatora Nikołaja Cukanowa i że jeśli zamek zostanie obudowany, to raczej jako możliwie najbliższa oryginałowi rekonstrukcja. Zapytany o reakcję na słowa p.o. gubernatora, Artur Sarnitz powiedział Wyborczej, że spodziewał się takiej decyzji, bo projekt rekonstrukcji „był wbrew rozwojowi wydarzeń, który można było obserwować w ciągu kilku ostatnich lat”. Jego zdaniem decyzja o rezygnacji z rekonstrukcji zamku jest rezultatem zmiany władzy w obwodzie, a wypowiedź p.o. gubernatora można postrzegać jako deklarację ideologiczną. Z kolei Aleksandr Popadin, kulturoznawca i historyk architektury, który był dyrektorem „Serca Miasta” i brał udział w przygotowaniu konkursu na projekt obudowy zamku uważa, że dyskusji o historycznym centrum Kaliningradu nie można sprowadzać do alternatywy: albo zamek, albo Dom Sowietów. – Obecny p.o. gubernatora na pewno zna stanowisko Moskwy w tej sprawie. Jego dyrektywy nie postrzegałbym w kategoriach „żadnych post-zamków” [czyli projektów nawiązujących do zamku i symbolicznie przywracających go miejskiej przestrzeni – przyp. red. ], a raczej jako sygnał, że Moskwa w końcu poważnie potraktowała projekt „Serce Miasta”. By odtworzyć miejską aktywność na Królewskiej Górze konieczne jest ożywienie Domu Sowietów, to punkt numer jeden. Także dla Moskwy, z ideologicznego i symbolicznego punktu widzenia, to punkt numer jeden. Ostatecznie los ruin zamku zadecyduje się w kolejnej fazie, po mundialu i „starcie” Domu Sowietów. Do tego czasu może zmienić się kontekst. – powiedział Popadin w komentarzy dla Wyborczej, podkreślając, że inny projekt, który zwyciężył w organizowanym przez „Serce Miasta” konkursie na zagospodarowanie centrum miasta, który obejmuje teren o powierzchni 60 hektarów jest stopniowo realizowany we współpracy z miejscowymi władzami. Wypowiedź p.o. gubernatora obwodu Alichanowa jest szeroko komentowana przez kaliningradzkie media i gorąco dyskutowana w sieciach społecznościowych. Jednak to, co bardziej oburza opinię publiczną w Kaliningradzie, to nie decyzja o rezygnacji z rekonstrukcji zamku, ale styl, w jakim została przyjęta i zakomunikowana. Nie przeprowadzono na ten temat żadnych konsultacji społecznych. W internetowych komentarzach powtarza się też opinia, że Alichanow nie ma mandatu do podejmowania jednoosobowo decyzji dotyczących miejskiej polityki, bo nie jest merem Kaliningradu, nie jest także pełnoprawnym gubernatorem. Krzyżacki zamek w Królewcu został częściowo zniszczony w czasie bombardowań II wojny światowej. Jego ruiny wiele lat stały w centrum Kaliningradu, ale w 1968 został wysadzony jako „symbol pruskiego militaryzmu”, by oczyścić plac pod budowę Domu Sowietów.